Rob Paine's roots run deep. From the moment he heard the deep dubby sounds of Reggae as just a youth he knew he had found his sound. His love for the heavy Reggae sounds grew into a forward movement and soon took on a life of it's own. In 1993 Rob began DJ'ing and throwing events with his crew, "Circle Productions", who were responsible for the most popular parties and weekly club nights in Philadelphia throughout the 90's. During this time Rob started producing a broad range of reggae and reggae influenced music including house, deep techno, broken beat, dub, and down-tempo. His unique sounds were soon being released on labels like Large, Tango, Shaboom & Greyhound just to name a few. Following the success of those tracks, his music was licensed to labels like Bedrock, Fabric & NRK. In 1998 Rob formed his own imprint, Worship Recordings. The Shakedown events were soon developed as an outlet to showcase his productions and the artists signed to his label. Ten years later, the Shakedown is still going strong. Over the years Rob has performed at some of the most exclusive clubs and events in locations like Canada, Mexico, Jamaica and London. He has played the infamous Fabric, PS1 in NYC, and Francois K's Deep Space event. He has held monthly residencies in San Francisco, weeklies in South Beach Miami, performed year after year at the Shambhala & Soundwave festivals in BC, and is currently holding down residencies in DC and Philadelphia. When we asked Rob about holding it altogether he said "It's really exciting to be able to switch between the two genres of house & reggae... Rinse out a mash up of the two and everything in between. It's always about keeping the dance floor on fire and getting the crowd to come with you on that journey through your set with out missing a beat." Rob produces the majority of the projects released on Worship. In 1999 he was awarded the 'Most Innovative Producer' by the Philadelphia City Paper. His 'dub house' style of production marked him as a forward thinker, blazing the path for future infusions of dub and house sounds for years to come. Rob Paine is an innovator, visionary & one of the cities most prolific DJ's, producers & musicians. 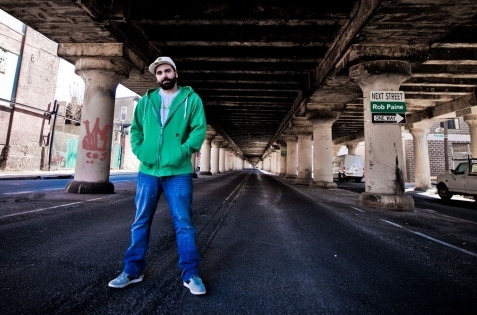 He continually pushes the elements of dub into house and techno music. He has created a world renowned studio & sound system with his full commitment to the city of Philadelphia's ever continuing music mecca. His talent shines furiously every time he performs whether it is House or Reggae or somewhere in between. Rob Paine does not disappoint.